Moving into a new home is an exciting time but it can also be stressful. Don’t despair. Whether you’re doing it yourself, asking friends for a little help or hiring professionals, here is your moving guide to help get you through it. TIP: If moving in spring or summer, earn some extra cash and hold a moving sale to help get rid of items you don’t need or want for your new space. On-line forums such as craigslist, varage, are also great options to advertise sale items. • If you have children and you are moving to a new school district, start arranging the school transferring process. • Order boxes and moving supplies (packing tape, bubble wrap, tissue paper, stock up on newspaper, etc.) required for your move. • Time to start packing! To make it easier, begin with the items in your home you do not use regularly. Be sure to clearly label or number your boxes to make the unpacking easier. Remember do not make the boxes too heavy. 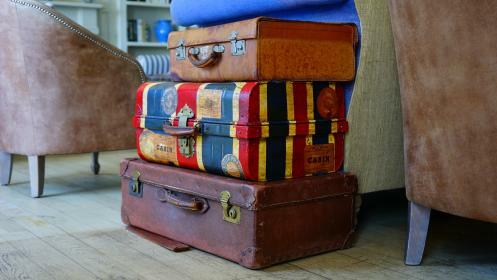 • As you pack, make note of items of significant value. Depending on your insurance agreement with your moving company, you will need to declare items of value in case items are lost or damaged. Lets hope not - But better to be safe than Sorry. • At your local postal office, fill out a change of address form with your new address. At this point, start to pay attention to the mail you receive and for each, start to notify the sender of change of address, so they can update their system before next billing is mailed out. • Banks, Cable and phone providers, Insurance companies, Hydro and utility companies, Credit card companies, Doctor and dentist, Accountants, CRA, ICBC, and any subscriptions you may have be receiving. • Confirm your reservations with your movers or truck rental company. Start emptying the freezer, so you will have less perishables for moving. Maybe you want to start eating in more. • If moving into a strata property, please notify the management company of the moving day and make arrangements for loading, security and elevator arrangements. • Set aside the items of importance you wish to transport to your new home yourself (i.e. jewellery and passports). • Re-confirm arrival time of your moving truck. If moving yourself, re-confirm your reservations with the truck rental company. • Pack a travel bag with the items your family may need on moving day such as tooth brushes, change of clothing, medications, hair bushes, soap, toilet paper, paper plates and cups, aspirin, etc. • Before the movers leave, check your belongings and note on the inventory paperwork any damaged items. • Moving into a new home is an exciting time but it can also be stressful. Don’t despair. • TIP: Weekends and holiday long weekends are busy times for movers and truck rental companies. Book far in advance (at least 2 to 3 months) to ensure you get a moving truck for the day you need to move.